This article was originally published in PC Gamer issue 323. For more quality articles about all things PC gaming, you can subscribe now in the UK and the US. A scientist sits in a glass cell, staring at a fridge. He’s been there for hours, maybe days. But he can’t look away from the fridge. If he does, he says it’ll ‘diverge’, and from the sheer terror in his voice, I can only assume that’s a bad thing. This is one of the many peculiar artefacts stored in the Oldest House, a monolithic, windowless skyscraper in downtown Manhattan that serves as the secret headquarters of the Federal Bureau of Control. The FBC investigates paranormal phenomena and objects that exhibit odd, reality-bending behaviour—including that mysterious fridge. As Jesse Faden, our protagonist and the new director of the bureau, wanders the stark, brutalist halls of the Oldest House, she sees rows of identical cells containing other mundane objects—a wrecked car, an old television set—that, for whatever reason, have to be kept away from the general public. In some ways, Control is a classic Remedy game: a slick, cinematic third-person shooter with a strong narrative focus, a dark atmosphere, and a hint of the surreal. But structurally it’s something completely new for the studio. The Oldest House is a hub of sorts, with missions branching off from it. It’s a place you’ll return to regularly, using newly acquired powers to reach areas that were previously inaccessible. From the outside, the Oldest House looks like a featureless block of concrete, but inside it’s a weird, abstract, ever-changing space where the bounds of reality are paper-thin. The walls and floor move and shift around you, swirling portals open up out of nowhere, bodies float in the air and the normal rules of physics clearly do not apply. The Oldest House is also being infected by an evil force known as the Hiss: a creeping, organic malevolence that’s in stark contrast to the hard lines and cold austerity of the building. The walls and floor move and shift around you, swirling portals open up out of nowhere, bodies float in the air and the normal rules of physics clearly do not apply. In one scene I watch Jesse pull a light switch, only to appear in what looks like a dusty old ’70s motel. You’ll travel between realities and timelines like this frequently in Control, thanks to the mind-bending, multidimensional properties of the Oldest House. This is another exciting change for Remedy, whose settings are usually more grounded and familiar. The studio has always used the tropes of genre fiction as the basis for its games—horror, pulpy noir, science fiction—but Control is something totally unique. Jesse may be the director of the FBC, but she’s no pen-pusher. Her sidearm, called a Service Weapon, is a gun that can mutate into several different forms, replacing the traditional shooter hierarchy. In my demo I see her switch from a pretty standard pistol, its most basic form, to a variant called Shatter that has a wide spread and can take down multiple enemies at once. You’ll need it, because the Hiss has possessed the majority of the bureau’s employees, including armed guards, and turned them against you. But, more excitingly, Jesse can use an array of supernatural powers, too. She can pluck objects from the world using telekinesis and launch them at enemies. In an impressive example of this, I watch lead designer Paul Ehreth grab a forklift truck, levitate it in the air, then slam it into a group of Hiss-possessed security guards, killing them in one hit. The game’s levels are filled with everyday objects to wield as telekinetic weapons, and it’s possible to defeat enemies by knocking them off or into things. Jesse can also use her telekinetic powers to grab chunks of rubble and use them as a shield. The combination of these powers, the Service Weapon, and a realistic, reactive physics system should make for some thrilling and dynamic combat. But Control won’t be a relentless parade of action setpieces: we’ll also get to spend time exploring the Oldest House, finding secrets and uncovering the story at a more leisurely, less prescribed pace. There are optional sidequests, too, including helping the fridge guy. “I’m enjoying the challenge of writing a story that isn’t so linear,” says Lake. “And because our tech has advanced so much, I can do things I couldn’t even conceive of in previous projects. First and foremost, we want the gameplay to be good, and deeper than anything we’ve ever done. And I took that as a challenge, to come up with a story and build a world and set of characters that reinforce the gameplay and lift it up. A key character in Control is Trench, the former director of the FBC. The bureau has been overrun by the Hiss as a result of his failure as director, leaving a mess for Jesse to clean up. “We needed a character that represented the place and its questionable methods,” Lake says. “I thought about one of our earlier characters, that hard-boiled cop. What if he ended up in a position of power? Someone who has suffered a great tragedy. A man of action, a cynic who has been forced to make some tough choices and is tired of it. “This was the first thing I wrote, but then I took a step back,” he says. “We needed a hero who comes into the world fresh. But it would also be beneficial if the character wasn’t a total outsider, and had some connection to what’s going on.” This link involves a destructive, traumatic event in Jesse’s childhood involving dark forces that she didn’t understand at the time, but that has shaped her life and personality. At the end of my demo Jesse levitates (another one of her powers) towards an old TV set that radiates an otherworldly aura. She recites the words of some kind of ritual, touches the television, and finds herself floating in a white void in front of a vast upside-down black pyramid. This enigmatic object seems to be a big part of Control’s story. I also notice it on one of the doors in the ’70s motel Jesse visited earlier. The demo ends before I get any sense of what it is or what it wants, but it’s a powerful, eerie image. I missed Remedy’s weirdness in Quantum Break, so the idea of the studio doubling down on it in Control is exciting. The Oldest House is an unpredictable setting, giving the team an opportunity to flex its imagination. 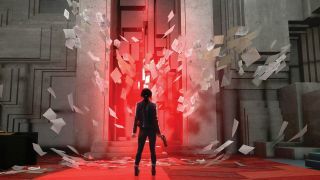 The roots of Remedy are still there—namely elaborate, cinematic gun combat—but it’s good to see the designers and writers experimenting with something more open-ended. I don’t know what other secrets and artefacts are waiting to be discovered in the Oldest House, but I can’t wait to find out. Just don’t look away from the fridge.